A journey into Protobuf. What is it, why use it and some examples. Originally, google designed protobuf with the aim of providing a better way to transmit data among their systems, compared to XML approach which ends up with larger size, slower speed and complicated usage. 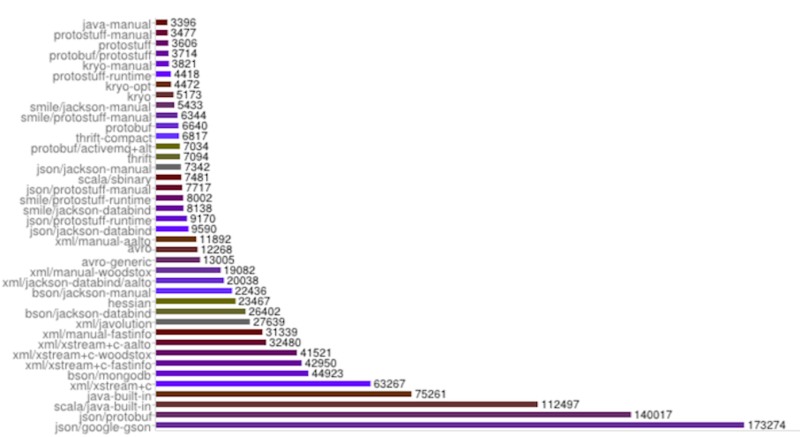 But, surprisingly, as you will see later in this blog, protobuf even outperforms JSON. There are 3 protobuf message types used later in this blog, and they are ArticleCollection, Article and Author. The message format & definition is simple, each message type is composed of one or more data fields numbered uniquely, and each field is a name value pair, where value can be number (integers/floating-point), boolean, string, raw bytes or even other protobuf message types (seen above), which allows you to structure your data in a more clear & clean way. Those unique numbers are used for message data encoding purpose, you can find out more about how protobuf message is encoded in Encoding page. 2 programs were developed for this blog. Both are available in this github repository. The first program is very simple which composed of two tasks - Reader and Writer. The writer is responsible for serializing message data and write data to disk. The reader will deserialize the message stored on dist and read data back into program to display. The second program is a web app composed of a react frontend and a dummy backend web service api. The frontend is mainly consuming and displaying data requested from the web service. Once message is defined, you run the protobuf compiler on the .proto file and specify the programming language you want to use for your protobuf message to generate corresponding data access classes. You can find corresponding getters & setters for each field defined in the .proto file (e.g. in this example, name() and set_name()), as well as methods to serialize/deserialize message data. In the second program, the web service is written in python, to get the python version of data classes, you only need to change the --cpp_out option in the compiler command above to --python_out. And for the react frontend, we will be using a js package called protobufjs which will be explained later. Protobuf has a awesome feature that it supports backwards-compatiblity, so developers can keep adding new fields to existing message definitions, the old binaries will just ignore the new fields when parsing the new serialized/deserialized fields when parsing. You can find more detailed reference for using auto generated protobuf code in the API page. As stated before, writer will write the structured data to disk so that other programs can read it later. If we don’t use protobuf, there are also other choices for us. One possible solution is to convert data into pure string, and write the string data to disk. This is simple, e.g. id number 111011 could become string “111011”. There is nothing wrong for using this solution, but if we think more, then there is a problem that this solution will complicate the task for developer writing reader and writer. E.g. the id number 111011 can be a single number string 111011, but can also be a string with delimiter 1|1|1|0|1|1 etc. If so, the writer program has to define a rule of using delimiters, then reader program has to deal with different delimiters in the encoded message, which could leads to other potential problems. At last, we will find that a simple program has to write many additional code to deal with message format. But if we use protobuf, reader and writer won’t consider the message encoding format problem, the message data is described in the definition file, the compiler will generate access classes for us, reader an writer can simply use the classes generated to accomplish the task. The generated classes have a serials of methods to read and modify the data in the structured message. The serialization/deserialization process is handled entirely by the code generated by protobuf compiler, which is very robust. ParseFromIstream reads information from an input stream to deserialize data, SerializeToOstream serializes the data and then writes to output stream. To see the complete project, you can visit this github repository. This piece of example program is very simple, but if we carefully modify it, then we can turn it into a more useful program. E.g. replace disk to network socket, then we can implement a data exchange task over a network for a remote procedure call (RPC) system. And data persist storage, data exchange over network are the most important application area for protobuf. After going through the first example, hopefully you will get a basic understanding of protobuf. Now comes the interesting part, we will go through a real web app that utilizes protobuf to exchange data between client and server. The web app has a react frontend and a python backend web service. The frontend is simply requesting & displaying data, the backend service will first generate some random data when it boots up and send them when client requests. The app.py is the place that starts the server, it uses the Flask package to handle the heavy tasks for creating a server. To start the web service server, first make sure all the python packages are installed, run the following command in your terminal pip install -r requirements.txt, after all the packages are installed, type python app.py to start the server. As you can see, the data size transmitted by using protobuf message is smaller than using JSON, the difference is relatively small, since the demo app is not a large scale program, but as you can image, once the program is scaled to a very large level, the data size being transmitted is going to increase dramatically, then the saving for data size is going to be obvious. In the app.js file under demo-app/client/src/ folder, pay attentation to loadMessageDef() and loadArticles() these two methods where the actual magic happens. As you can see, protobuf.js make data handling a lot easier for us. To start the client app, go to demo-app/client/ folder and type npm start in the terminal. Then you can start interaction in the browser. Hopefully you have a more in-depth knowledge for protobuf up until now. Some people will probably ask why not using other existing technologies like XML, JOSN etc. So what’s the difference? A simple answer: protobuf is simple and fast. To prove this, the project thrift-protobuf-compare compared these technologies, figure 1 displays the test result, the bar represents the total time for manipulating an object including creating object, serializing object and then deserializing it. From the test result we can see that protobuf performed very well. If you are interested, you can visit thrift-protobuf-compare project website for more detail. As stated at the beginning of blog, protobuf is smaller, faster and simpler compared to XML. You have full control over your structured data definition, you only need to define your message once by protobuf, then you can use a variety of languages to read and write your message data from different data streams. Also you can even update your message definition without redeploying your program, since protobuf supports backward backwards-compatiblity. And protobuf syntax is more clear, and doesn’t require a interpreter like XML. This is because protobuf compiler will compile the message definition into corresponding data access classes in order to do serialization/deserialization. Even though protobuf has many advantages over XML, it still cannot completely replace XML. protobuf cannot represent complex concept. It’s currently mainly used by Google and lack of popularity. And it also adds a little bit of development effort compared to just using JSON, as can be seen from the above example. Hopefully after reading this introductory article, you will learn a brand new serialization/deserialization technology and add it to your toolbox. Whether or not to use it in your project would really depend on the situation, if you project cares about performance, speed and data size, protobuf might be a good candidate, especially for a RPC system. But for a regular web app, I think JSON is probably enough. 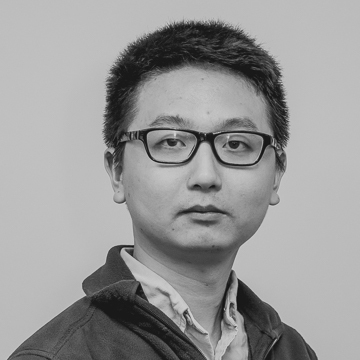 Yan graduated from Miami University with a BS of Software Engineering and MS of Computer Science. He is a big fan of adventure sports, among which skiing and skydiving are his favorite. His ultimate goal is to start wingsuit flying one day. He is also a believer of Bitcoin & cryptocurrency, and is passionate about blockchain technology.